Be introduced to a core program which uses effective exercises for developing the aesthetic appearance of the core while reducing force and risk to the spine. Understand the difference between core strength and core endurance exercises. Learn the role of anti-movement exercises for endurance and movement based exercises to improve strength in training for both improved appearance and function. Discover the role flexibility and mobility plays in core exercise and core development. See and practice flexibility and mobility exercises to increase core function and development. 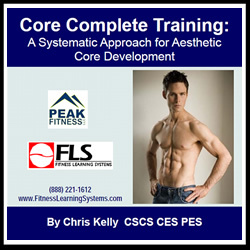 See and practice exercises and concepts for Plank, Deadbug, Posterior Core and Vertical Core training applications. Discover ways to bridge core training on the floor with standing core training for more complete function. Learn core assessments for determining a client's initial core fitness level, any compensations or problems, and to determine progress. Apply assessment to individualized training needs. Learn and apply core exercise training for daily and weekly programs. Understand how to integrate core training into client sessions and group exercise.